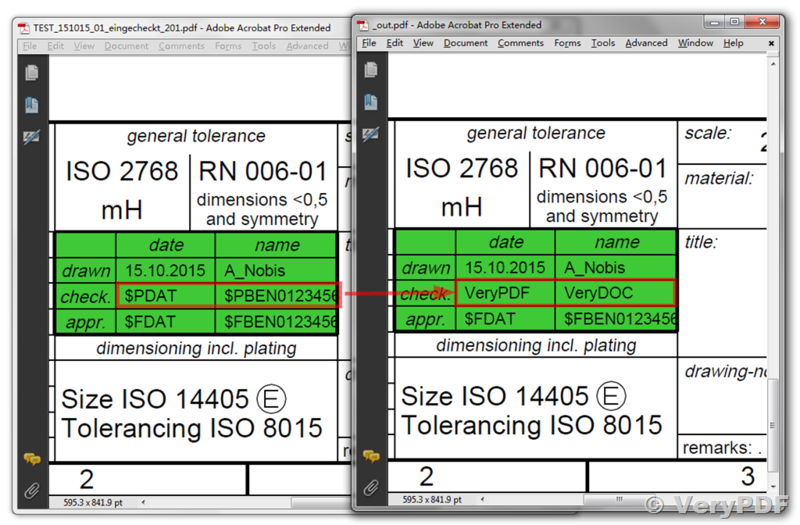 We're using a server license to exchange within our PDF-based drawings temporary placeholders by real database values. 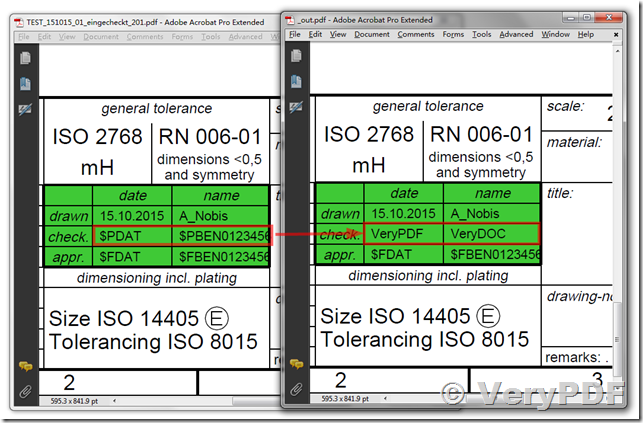 But when we do this, some characters of the database strings aren't shown on the PDF after calling VeryPDF. Especially the upper case J and W are invisible. If I copy the strings out of the PDF into lets say the Notepad editor, all characters are shown. So somehow VeryPDF inserts invisible characters. Since these are the names of responsible persons it's an absolutely no-go that their names are incomplete. Please help me with this topic as soon as possible. As you could have seen by looking at my email address I'm employee of a company in Germany. When you check up your database you can see what product we are using. - The placeholders $PBEN0123456 and $FBEN0123456 were extended since we had the idea that the space within the text field is too short for the replacement. These placeholders should be replaced by the user names of my colleges. There are 2 revisions (200 and 201) of our PDFs each with the file before (eingecheckt = checked in) and after (freigegeben = approved) the text replacement. Revision 201 has a green text field since we thought that maybe the replaced text is partially written white. As you can see the letters J and W are invisible. If you copy and paste these PDF-strings into a text editor all letters are available. As a customer of your company I expect that you analyse and solve my problem without the need that I order a more expensive support service. So don’t abuse your ticket system as an advertising platform. This entry was posted in PDF Text Replacer and tagged replace pdf text, replace text. Bookmark the permalink.